My life is good; so why am I feeling bad? Have you ever had one of those days? 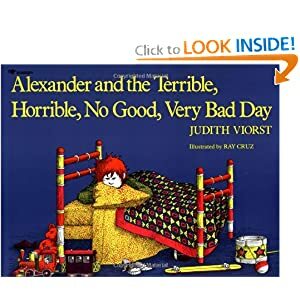 Maybe not a day worthy of posting to the FML website, but one that reminds you of the children’s book, Alexander and the Terrible, Horrible, No Good, Very Bad Day? Monday was like that for me. By the time the day ended, I couldn’t isolate anything that I’d call “terrible” about my life — I just was feeling bad. It started Sunday, when my college kids returned to school after being home for a week on spring break. I liked having our whole family together again, enjoyed seeing the older two tease their younger brother. It was just like old times. Then they went back to their “real” homes at college, to their friends and their lives there. While it’s nice to stop sharing my car and go back to my routine in our household of three, I know that next year we’ll be a household of two — and I’m worried that’s not going to feel so great, at least not initially. Knowing I wasn’t feeling particularly good, I thought I’d ease into Monday, use the morning to catch up on paperwork, do laundry, change sheets and clean up my older kids’ bedrooms. They left their rooms as if they’d been leaving a hotel — beds unmade, shopping bags on the floor, papers and receipts on the night tables. Straightening up in the quiet, I felt like a housekeeper — not the mother of three well-adjusted children. Then I realized one of my rings was missing. Not my wedding ring, but the one my husband gave me for our twenty-fifth anniversary. A little worried, I checked the bathroom, the kitchen counter, my jewelry box. Not there. So I looked harder: I put my hand down the kitchen sink to check the disposal, looked all around the house. Cleaned out my purse, checked the pockets of my clothes. I called the restaurant where we had dinner last night. No, they hadn’t seen my ring. So I went through the last three days’ worth of garbage, then turned over the recycling bin and emptied it out to make sure the ring hadn’t slipped off my finger when I tossed out old magazines. Still nothing. I went outside and dug through the compost, running my hands through banana peels, coffee grounds, chicken bones, Saturday’s Indian takeout, and more slime I won’t discuss. But still no ring. So at least we weren’t about to send it off with the garbage truck. But if the ring wasn’t in the trash, I’d have to look more aggressively inside the house. I cleaned out two bathroom drawers, then dismantled the sink drain. No luck. Finally, something possessed me to check a closet I had looked in two hours earlier. This time I saw it. But you know what? I thought I’d feel happy to find the ring, especially after looking all that time. Instead I just felt relieved. And emotionally worn out. I left to play a tennis match I had scheduled for the afternoon. It lasted only an hour. I lost 6-0, 6-0. So I went for a cappuccino and one of those delicious seven-layer cookie bars. I sat and stared out the coffeeshop window while I gathered my strength to go grocery shopping. I wondered whether I should quit playing tennis, spend my time on something I could do well. But wasn’t it okay to like a sport and want to play it, even if I played poorly? How did I get here, to this place of feeling bad? I have a great life: faith, family, friends, health, financial stability, and more. So why, all too often, do I spin down the woe-is-me vortex? Sure, I know there are real people with real problems in this world. And I’m not one of them. It’s just a lot easier to stay in my personal vortex, than to get out of it and experience someone else’s. I bought my groceries, went home and cooked a good dinner. At least that much of my day went okay. Actually, the whole day was fine, if you consider it in relation to the day of someone with real problems. What drags you down, and how do you pull out of your vortex? Let me know in the comments! What do you get from three hours of spinning, besides sore legs? It took a few days, but my legs eventually recuperated from the three-hour spinning extravaganza. While I may have been silly to sign up for such torture in the first place, I gained some valuable lessons. I can complete a three-hour spin class. Similar to the feeling of accomplishment one gains from finishing a race, it feels good to know I did it. There’s a feeling of self-confidence you get just from learning that you can do something hard. My max heart rate is 195. This information will help me make my workouts more efficient and precise, as I can now work to different percentages of my “max.” The calculation of max heart rate was, for me, much different than I would have gotten with a standard suggested estimate of 220 minus your age. Now I just need to learn how to work all those fancy buttons on the heart rate monitor arm band! For example, I’ve learned that I can raise my heart rate quickly by standing up to pedal, but maintaining it at a certain level is easier when seated, or in biker-speak, when you’re “in the saddle.” I also realized I have to stop slacking off before I reach my “recovery beats per minute,” or else my heart rate will fall too far and I’ll have to work to raise it up again. This is a depressing one. During our three-hour class, we were not supposed to let our heart rates drop below 70% of maximum at any time. Although 70% is nominally an “endurance” or “working recovery” heart rate level, it’s actually hard to maintain when you’re wanting 45 seconds at, say, 60% of your max — so you can drink water, ease up on your legs, wipe away some of the sweat. However, the workshop taught me to push myself more uniformly during my regular classes. When I hobbled off the bike that day, the calorie counter read 1493, and I was sweatier than I ever get while playing tennis. To make things worse, I played a singles tennis match the next day — which probably wasn’t the smartest idea, since my legs were so sore I could barely move across the court. But in general, the conditioning and heart rate info I’m gaining from spinning ought to benefit my tennis game — or at least my ability to survive three long sets. Now I need to incorporate heartbeats per minute variations into my tennis workout — and I’m not referring to the way my heart races after after my opponent makes a poor line call on an important point! That, however, is a subject for another post. Do you measure your heart rate? If so, what do you do with the information? Last weekend I did a three-hour spin heart rate workshop at Uforia Studios in Palo Alto. The monotony of spinning for three hours didn’t bother me, but I’m not in shape to ride a bike for that long. Alas, no Tour de France for me — not yet, at least. We did a test to determine our maximum heart rate, then spent the rest of the time working at different percentages of our max — learning how to increase/decrease/maintain different heart rates, etc. I was probably a little crazy to have signed up for the class, and I had to remind myself more than once during the three hours that it was actually something I had chosen to do. After awhile it was easy to ask myself, why am I spending three hours in a dimly-lit room, peddling a bike that’s doesn’t go anywhere? Although testing to find your max heart rate sounds difficult, this was actually the easiest part of the morning. Maybe because it happened first, before I got tired. Everyone was wearing a heart rate monitor, and most of them synced with the bikes’ computers. Part of the fun of attending a live sports event is observing the other fans. While tennis fans’ behavior is typically more controlled than you find at a football or hockey game, their fashion choices cover a wide range. I saw plenty of “RF” and “Vamos Rafa” T-shirts at the BNP Paribas Open, but in general, Indian Wells fashion options at their most interesting incorporate a sense for the hot climate and Southern California desert atmosphere. This post records my observations during the three days I spent at the tournament. While baseball caps proliferate, other choices include flaps to protect the back of the neck, or broad brims that make it difficult for the person standing or sitting behind to see. But with sunny conditions and temperatures that climb into the 90’s, you need sunscreen and a good hat. Indian Wells fashion doesn’t generate the same excitement as fashion does at a Grand Slam event. The BNP Paribas isn’t a tournament where the pros’ sponsors supply them with new outfits to generate buzz and drive sales of their merchandise when TV viewers buy online or visit their local tennis shops to refresh their gear. However, I still enjoyed seeing the player fashions up close, and a few of them were even sporting new outfits. One of the most talked-about fashion statements was a new skirt design by BNP Paribas Open sponsor Fila, for Jelena Jankovic. Dubbed “the carwash dress,” owing to its front fabric strips resembling the felt runners in brushless carwashes, the skirt or dress (it comes in two versions) is one of the more innovative tennis fashions this year. When the player is standing still, the fabric strips look like pleats in a cheerleader dress. But when she moves, you can see they are strips of fabric. Thankfully, Fila put these fabric strips only in the front — the back of the skirt has neither slits nor pleats. It looks great on Jelena, but I’m not sure the carwash skirt is a look I’d want for myself. If you purchase the product or service I reference with some of this blog's links, I will receive a small “affiliate commission.” I am disclosing this in accordance with the Federal Trade Commission’s 16 CFR, Part 255: “Guides Concerning the Use of Endorsements and Testimonials in Advertising.” Regardless of whether I receive a commission, I only recommend products or services I use personally and believe will be good for my readers.